Faculty, staff and students who wish to hone their writing skills to a razor-sharp point have a new resource. 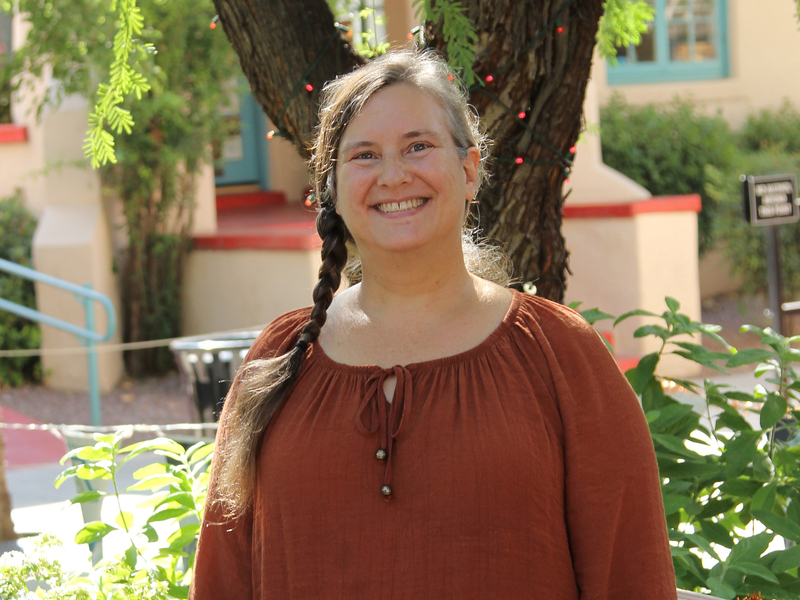 Leslie Dupont, PhD, joined the University of Arizona College of Nursing last month as Writing Coach. Her wordsmithing skills are available in a variety of ways: she’s available for one-on-one consultations or for working with small writing groups; she holds weekly open hours three times weekly for drop-in questions and brainstorming sessions; she tweets writing-related tips and tricks (follow here), leads workshops, delivers class presentations and holds focus groups. She also has a collection of writing-related books that are available for checkout for up to two weeks. Tell us about your background and what drew you to a career as a writing coach/instructor. My background is in writing and humanities. I've taught writing and writing-intensive subjects since 1989, and I earned my PhD in Rhetoric, Composition, and the Teaching of English in 1999. As a writing coach/instructor, I have worked with people from every continent and been exposed to hundreds of research topics, specialties, cultural and experiential backgrounds, learning styles, and learning contexts, both online and in person. This variety keeps me young at heart and challenges me to stay flexible and open. What attracted you to the College of Nursing? In my previous job, I worked with many undergraduate and graduate Nursing students, and I found myself empathizing with the challenges many of them faced when shifting back and forth between clinical and academic writing styles. These same challenges are experienced by so many of us, both academic and non-academic, and I enjoy helping people become increasingly self-confident, flexible, and independent when writing for different purposes. In my imagination, I brainstormed ideas and strategies that might be useful for these writers, and when the opportunity arose to apply for the CON Writing Coach position, I jumped at the chance. How does writing for a higher education audience differ from writing for other groups? Higher education writing contexts are often more formal in terms of style and content than writing for other groups. There is a strong emphasis on in-depth research and, for many, publication in peer-reviewed journals. Not all writing in higher ed is that structured and formal, though. Newsletters, emails, memos, reports, and less formal professional articles are all produced in higher ed settings as well as digital and other kinds of text. In fact, it might be this extreme variety of styles and genres that is most distinctive about writing in higher education. Why are effective writing skills important? We communicate through language--much of which is written. Having effective writing skills means that you not only communicate clearly but also remember the readers on the other end of your documents. What are three things people might not know about effective writing? You don't have to be the world's greatest writer to be an effective writer. It's not about being perfect; it's about being accurate, clear, and aware of the impact your words and the ways you express them have on others. Writing is a skill, not an ability that you are born with. Just as in learning to play a sport or musical instrument, to become an effective writer, you need to practice, get feedback, revise, play, and experiment. Most effective writers start with messy, rough first drafts. They improve these drafts through revision. It's like warming up and practicing before a game--you never walk onto the court or field cold and stiff if you want to do well. It's the same with writing: If you write one draft and do little to nothing with it, you're not going to do well--not because you can't but because you didn't do the preparation you needed to do. I was born in Connecticut and spent most of my childhood there. After a very brief time in Florida when I was 17 and 18, I came out to Arizona and have been here ever since. What do you like to spend your free time?